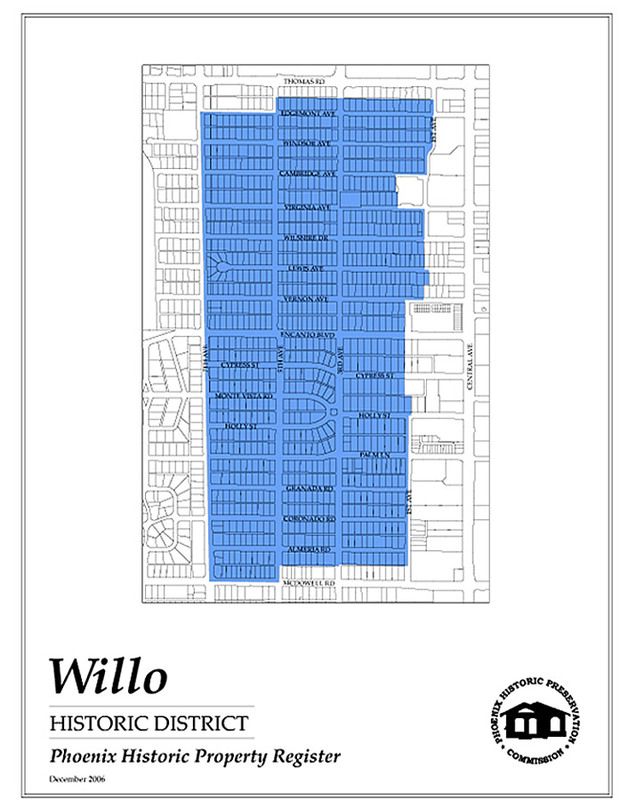 Willo Historic District boundaries are roughly: Thomas and McDowell roads, Central and 7th avenues. Willo residents are accustomed to Samantha and others like her who take an hour or so out of their weekend schedules to daydream and wander the palm-lined streets of this downtown neighborhood. They even open a handful of homes to let thousands like Samantha dream of life inside at their Annual Willo Home Tour. Home tours happen every year in our downtown historic districts, and Willo’s is probably the best-attended tour in central Phoenix. There’s a reason for that. Everyone seems to think “Willo” when they think historic Phoenix. Well-kept homes and manicured lawns make up almost a square mile of charming residential neighborhood just north of downtown Phoenix. Tudors, Bungalows, and Spanish Colonials—classic historic examples from the 1920s and 30s with hardwood floors and multi-paned windows– line the streets to welcome admirers in the southern end of the Willo Historic District. Travel north, with tail-wagging pup (on 3rd Avenue, please. It’s one-way. 5th Avenue, also one-way, will take you southbound again), and you’ll find classic 1940s and early 50s Ranch-style homes as you get closer to Thomas Road. And more often than not, you’ll find a guesthouse in back no matter what year the home was built. What’s not to love? Well, if you’re Samantha—the price. Willo properties typically have an entry level of around $300,000 and can escalate to over $800,000 in a strong real estate market. But if Willo fits your budget, this coveted downtown spot offers friendly neighbors who’ll greet you on the streets, trendy restaurants and shopping along McDowell and Thomas roads, all with a peaceful and well-loved residential neighborhood in between. For many, life in the downtown Willo Historic District is about realizing you're a part of this vibrancy that makes up urban Phoenix. It's about knowing your neighbors, your grocers, and your dry cleaner by name. It's about knowing that all of these restaurants, shops and art galleries are here because of you and the people that cherish our inner city and call it home. If you're new to Willo and a dog owner like so many, you'll no doubt get to know neighbors quickly, as after-work walks down tree-lined streets is commonplace here. We might learn your dog's name before yours, but in no time you'll be greeted with the warmth and sincerity that makes living here such a pleasure. Welcome to historicphoenix.com, your #1 internet resource for buying and selling historic Willo real estate. 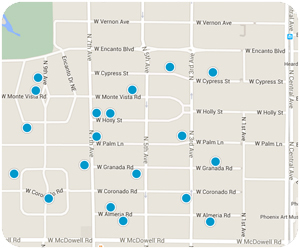 On this site, you will be able to find nearby school information, restaurants and grocery stores, buyer resources, seller resources, and search all Willo homes for sale. Our goal is to provide you with the most valuable information and service regarding historic Willo real estate and homes for sale. Through this site, we provide you with access to MLS listings and resources for buying and selling a home, but most of all, an easy way to access expert guidance as your time to buy or sell Willo real estate approaches. In today's real estate market, it takes more effort, time, and resources to sell your Willo home. We are personally committed and passionate not only about selling your home, but selling it for maximum market value. We offer our clients a full line of services and a network of service providers to not only provide you with maximum market exposure through our extensive and aggressive marketing plan, but to provide a tailor-made solution to handle all aspects of your real estate transaction including pre-listing preparation to best showcase your home. We also work with an extended list of service providers who can help meet all your needs related to the sale of your Willo home. Find out what your historic Willo home is worth TODAY. For most people, purchasing a home is the single largest and most exciting financial decision they can make. That is why we take finding a home for our clients very seriously. We're not only committed to finding you a home, but to finding you the absolute best home on the market at the best possible price, and if one does not exist on the market, we'll search off-market properties and do our very best to find you the right Willo historic home. This website also serves as a tool for clients to search properties currently on the market, receive up to the minute market updates through email, and even request showings. Start searching now OR let us do it for you!